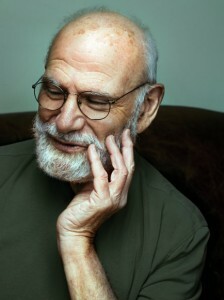 In an op-ed penned for the New York Times, 81-year-old Sacks revealed today that he has terminal cancer. Nine years ago, he was diagnosed with a rare ocular cancer, which recently metastasized after nearly a decade of good health. The disease now occupies a third of his liver. Upon learning the news, Hari Sreenivasan shared a story with PBS NewsHour staff about meeting Sacks for the first time. The scientist has face blindness — he is quite literally blind when it comes to recognizing faces, a condition Radiolab once explored with Sacks in detail. But somehow, he recognized Sreenivasan before greetings were exchanged. Sacks’ explanation? “I know you by the whites of your teeth,” he told Sreenivasan. In his op-ed, Sacks said he’s chosen to spend the rest of his time focusing on friends and family, cutting out all “inessential” parts of life. That includes watching NewsHour each night. Though he may not learn about the world from us anymore, we will undoubtedly continue to learn from him.